One of my children’s favorite meals of the year is also their most in-depth lesson in Christian theology. Years ago I discovered this beautiful Christian Seder meal adaptation by the husband and wife team of Directors of Family Life in the Diocese of Fort Wayne-South Bend, Fred and Lisa Everett. They masterfully intertwined readings from the Old and New Testament to give children and adults alike a clear understanding of the sacred mystery of the Eucharist and its fulfillment of the promise of the Old Covenant. Their script lays out a user friendly guide to making the Jewish Passover meal accessible to those interested in celebrating its significance to Holy Thursday. All senses are engaged throughout the celebration, inviting partakers young and old a role in the ceremonial supper. From the candle lighting, reading, listening, tasting, feet washing, and even a game at the end for small children, this is a meal families will remember and look forward to year after year. But most importantly, the sacred readings and prayers set the stage for the somber reality of Good Friday, as well as the joy of Easter. If you have never celebrated Holy Thursday as a family, here is a beautifully meaningful beginning. seder meal on Holy Thursday. A seder meal, of course, is a Jewish tradition that was set out in the book of Exodus as a means of remembering the original Passover when the Hebrews were finally freed from the clutches of Pharaoh. prayers, customs and symbols within the ritual. For example, the Jewish seder leaves an open seat at the table for the Prophet Elijah, the precursor of the Messiah, should he, in fact, return that very evening. Our Christian seder, on the other hand, affirms that John the Baptist has already played the role of Elijah in signaling the coming of the Messiah — Jesus of Nazareth. 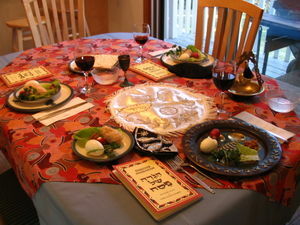 In our seder, a seat is left open for Jesus, should he, in fact, return that very evening. that the Last Supper celebrated by Jesus and his disciples was almost certainly a seder meal. In our own family, we have found that this tradition has not only deepened our appreciation and understanding of the Last Supper, but has also strengthened our identity as a people closely related to our spiritual elder brothers — the Jews. living spaces should be meticulously cleaned to ensure that not even a crumb of leavened bread remains before the seder meal. In our Christian version, we basically sweep and clean the kitchen and eating area and leave the Roman Meal bread in the pantry. We set and decorate the table as for a formal occasion, including two candles. and involves eating roasted lamb, unleavened bread called matzo and bitter herbs — usually horseradish. Over the centuries, other items have been added such as parsley, a roasted egg, a mixture of apples, nuts and wine (or grape juice) called charoseth that symbolizes the mortar and bricks used during slavery in Egypt, dishes of salt water and a cup of wine (or grape juice) for each person. horseradish and a quarter square of matzo (matzo crackers are available in most grocery stores in the section with Jewish food items). There is also an extra place setting left open for Jesus as a reminder of both his absence and his eventual return. plate: three whole squares of matzo are specially placed on top of each other, each separated by a napkin; an egg that has been boiled and then broiled until browned; and a lamb bone roasted with or without meat. Christian seder, to wash the feet of all of the other family members as Jesus did. This symbolizes that the father’s authority in the family is one of service for the good of all its members. horseradish, charoseth and other items with a series of ritual questions and answers. This is followed by a favorite family meal of ordinary foods. A final ritual closes the evening. dropped on the floor and the father sweeps them up as a symbol that the house is ready. sanctification means to be set apart and recalls how the Hebrews were physically freed by God to be his people and how Jesus fulfilled this covenant, freed us from sin and sanctified us with the gift of the Holy Spirit. Everyone drinks from his or her cup. of his disciples at the Last Supper. In Jesus’ time, this job would have been left to the lowest servant in the household. He goes on to wash the feet of those gathered around the table in imitation of Jesus. Bishops and pastors throughout the world perform this ancient ritual on this same evening at the Mass of the Lord’s Supper. He then finishes by washing his hands. dish of saltwater and to eat a bite of it in order to remember the bitterness and tears of slavery and the water of the Red Sea in which Pharoah’s army was drowned. the plate breaks it in half, puts one half back and hides the other half anywhere he wants in the house while everyone keeps their eyes closed. The children will look for it later. around four questions which the child poses to the father. Father: “Once are elder brothers were slaves in Egypt, but now they are free. would be free from our sins and be able to live as sons and daughters of God. do we eat only bitter ones? this night why do we dip them? miracles, a story of redemption, a story of the mighty power of God to overcome evil. Readers may be used. numerous, he thought. Suppose they join with our enemies and turn against us! slavery upon the Israelites. Still, God blessed His people in strength and number. READER 3: Moses grew and became aware of the sufferings of his people. a shepherd in the land of Midian, far from the cries of his suffering brothers. and eats it, symbolizing the bitterness of slavery. Then, each person places charoseth on a matzo and eats it, symbolizing the mortar that was used with the bricks during the time of slavery. The second cup — the cup of plagues — and the lamb bone. broke through Pharaoh’s hard heart. death of Jesus, God’s only Son. will pass over you and no plague will touch you when I punish Egypt.” (Ex. covenant and that Holy of Holies present in the original temple that contained the sacred bread has been replaced by the tabernacles of the world where the sacred bread from Heaven — Jesus himself — resides as our spiritual food. The egg is then dipped in the saltwater and eaten. meal of ordinary foods may be eaten. end of the regular meal, the children then search for the missing piece of matzo. Whoever finds it gets a small reward, like a coin or a piece of candy. The father then divides the matzo — called here the Afikomen — into pieces and distributes it. The third cup — the cup of redemption. The father then takes the cup. out the door to see if there is any sign of Jesus’ return. The father asks if he is here. The children respond that there is no sign of it. The father responds, “Maybe next year.” A final cup is raised and a prayer said praising God, thanking him for his goodness and asking that Jesus may soon return. Everyone responds, “Come, Lord Jesus.” This Christian seder is now complete.